Va Antonio Lucio Vivaldi - (4 Mart 1678—28 Jerrey Souree 1741) ny haggyrt Veneeshagh as ny chummeyder. Rug eh ayns Pobblaght ny Veneesh. 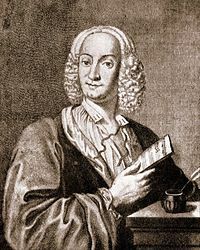 Ta tooilley coadanyn mychione Antonio Vivaldi ry-gheddyn ayns Wikimedia Commons.